Man has often gazed at the stars, and dreamt of flying into space. The imagination of Science Fiction writers from HG Wells to Isaac Asimov were full of stories where man had taken their first steps into space travel. Little did they know that it wasn’t man that would first touch the stars, but man’s best friend. During the 1950’s and 60’s, the USA and Russia were engaged in ‘The Space Race’. Both sides were determined to become the first the conquer space. During their early attempts at space exploration, the Russian premier, President Nikita Khrushchev was delighted with the positive reaction he and the USSR gained by their space exploration. Seizing an opportunity to outdo their American rivals, the Russians decided to take the race one step further and be the first nation to send a living creature into space. The Russians decided that dogs were the best creature to travel into space, rather than the chimpanzees or monkeys chosen for the the American space programme. 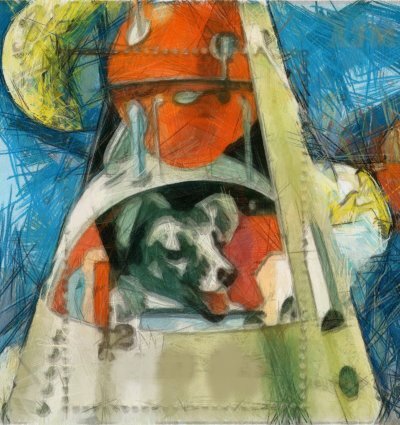 There were many early tests of sub orbital flights where dogs were used, and safely returned to earth. Special space suits were designed, and the dogs were trained to be able to stand still in confined spaces for long periods of time. In this section, you’ll learn more about some of the most significant missions that paved the way for human exploration of space.